I am a cradle Catholic (the cradle was trademarked 1950) who went on walkabout for several decades in midlife, first as a Jungian Gnostic and later as an Episcopalian. In 2010 I experienced a call to come home to the Church, which I did formally as the Church Year 2011 opened. Although I have worked for and with the Church for most of my life, I was far enough away from practice that the Church I returned to was very, very different from the Church I wandered away from. The resultant revertigo led me to talk to myself, and others who care to listen, in this blog. I have a special interest in the interplay between Catholicism and culture. I helped develop the pedagogical model for and was a contributor to the Bible Literacy Project’s The Bible and Its Influence, the first high school textbook on the Bible to be found constitutionally appropriate for use in public schools. I have been a retreat director and youth minister, and I lecture on religion and art in adult formation programs. When I first began working in catechetics, my general editor dismissed any sort of sentimentalism by scrawling “Pious twaddle!” in the margins in red. I’ve never managed to eliminate all of it—nor do I think I want to, as I have a certain fondness for Catholic kitsch—but I’ve made it my own task to help clients eliminate the most egregious twaddle from their projects. One of those clients was so charmed by the phrase—once he got over being offended by the criticism—that he had Tshirts made. Moving to Patheos, I’m keeping the blog name for sentimental (twaddly) reasons, but I hope that my posts are seldom twaddle, at least egregiously. 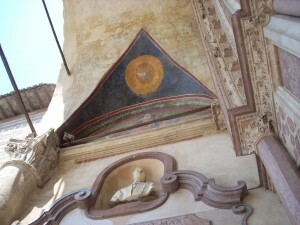 This fresco of the dove of the Holy Spirit hovers over the west entry porch of the Lower Basilica of St Francis in Assisi. It was while standing on that porch in June 2010 that I knew I needed to come home to the Church. Using this photo as a header does not in any way imply that there’s anything twaddly about the Holy Spirit! Instead, I hope to invoke the Spirit’s inspiration, openness, and peace, that this blog might be another such entryway for Catholics coming home.